Famous for its painter's community, Ubud is special in more ways than one. It has its own magic, and its particularly beautiful surroundings and gracious way of life have drawn celebrities and artists from all over the world in recent decades; some have even adopted Ubud as their own home. Ubud is now more than ever in the spotlight due to the famed book by Elizabeth Gilbert and movie "Eat Pray Love". If I have to describe Ubud Bali in one word I would say "idyllic". Despite the large numbers of tourists visiting this little village with streets that are too narrow for touring buses, Ubud has been able to maintain its traditional life. It is the meditation capital of Bali, many people come here purely to recharge their batteries from the fast paced western life, here you just surrender to the energies and let go. Ubud has been voted the top city in SE Asia in January 2010 by the Condé Nast Traveler, it is not hard to see why; everywhere you look is paradise with dense green jungles, myriads of rice fields and beautiful tropical gardens. Here Balinese men and women still place offerings gracefully on the side of the road and on temples; every day you will see many of them riding beautifully dressed on motor scooters to temples and ceremonies while holding colourful woven baskets, sometimes you can witness even up to four on a bike. This is not a village where you should be up and running...the order of the day is to RELAX and live in the NOW. It is more a place where you'll want to stroll around or just sit with a book and watch the colourful and delightful pictures pass by. If you can’t resist some action though, there is the Monkey Forest where you’ll be greeted by the many Macaque monkeys, they are quite friendly but please do not touch them or smile as they take this as a sign of aggression and will bite you. It's a must to visit Ubud markets which is a maze of shops that sell everything a traveller in Bali can imagine…and more. The village is surrounded by fertile land which has resulted in the beautiful rice field terraces you always find in travel and photo books on Bali. This is also an ideal location to explore the terraces yourself and take beautiful pictures while standing in the middle of the fields. In the past the rice fields and ideal irrigation systems have provided the people with a surplus in rice yields. Many years ago with time to spare the king of Sukawati ordered the rice farmers to dedicate their excess time on paintings for temples and palaces. From then this unique location has emerged into a painter’s village that has attracted many people, including foreigners who have played their part in forming various painting styles. It is not surprising to see that many artists feel at home in this village considering the mystical and inspiring setting. 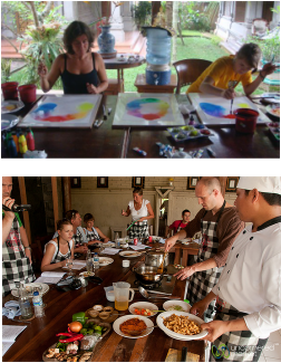 Today painting still plays an important role in Ubud and around. There are many galleries where painters sell their work. Additionally there are several important art museums that show special paintings that will create even more appreciation for this attractive and unique form of art. You can continue your cultural adventure in the evening where you can choose from many Balinese performances such as the graceful Legong dance, the cool-looking Kecak-trance dance and the funny Wayang Kulit shadow puppet plays. This is a great way to end your cultural day experience in Ubud Bali followed by a good glass of wine or a local Bintang in one of the many flower garden restaurants. Ubud is an ideal place to walk around, especially if you check out the small streets and alleys on the side of every road. They lead you to amazing places such as rice fields, river valleys, temples and Balinese living court yards. Ubud Bali has three big main roads which are all one way-streets. So you will definitely drive through them regularly if you are finding your way through Ubud by car, bike or motor scooter. The busiest and one of the longest is the Monkey Forest Road. This road starts in the south when you come into Ubud and ends all the way in the north at the crowded Ubud Market. This street has many shops, restaurants and places to stay. The many small alleys on both sides of the road are passages to tucked away hotels (many cheap homestays), spas and restaurants. Another road that you’ll certainly come across is Jalan Hanoman. Like Monkey Forest Road, this street is long and it has many shops, restaurants, hotels and homestays. Going towards Monkey Forest Rd, Jalan Hanoman comes to a fork, the right veers off to Monkey Forest Rd, whilst to the left is still Jalan Hanoman and goes on passing the ARMA museum then becomes Jalan Raya Pengosekan that takes you on to Lutundoh village. Ubud is relatively small so if you have the time you can easily walk around and see a lot. The streets and footpaths are a little bumpy, occasionally you might find a hole or two or a loose pavement so be careful (Hati Hati) of your footing. However look out for the colourful offerings which are placed along the streets and in front of shops. You can easily crush them with your feet while window shopping which is insulting to the Balinese. Everywhere in town you will find many private drivers sitting in the shade of a tree only to jump up when you come in sight. Instantly they will make this driving movement with their hands and at the same time wiggle a little with their body. ‘Transportation or TAXI...?’ is the first thing they say. If you reply with: ‘No thank you...’ ot 'Tidak Teramikasi' (pronounced as 'tear out my car seat'), you can immediately expect the next question ‘How about tomorrow...yes?’ They are harmless but can get on your nerves after passing dozen of them within minutes. But if you are considering touring around for a day then a private driver is what you need. Check out if you like their car and then bargain for a price that suits you. Usually it is around Rp.600,000 per day (7 hours) including a chatty driver and fuel, also when talking with the driver make sure you can understand him as you will have many questions while touring and he will have a lot he wants to tell you. Some drivers are very proficient with their English and a number also speak other languages such as German, French, and Chinese so take your time to find the right one, do not feel pressured in any way. Asking a few simple questions (such as 'Tell me more about what you can show me?') and listening to their replies will help your decision making. The Post Office is located on Jalan Jembawan on the east-side of Jalan Raya. The Ubud Clinic, 24H (0361-974911) for most medical issues can be found on the west-side of Jalan Raya before the Campuhan bridge and here bilingual staff are also available. If you need the Police (0361-975316) you can find them on Jalan Raya Andong in the north-eastern part of Ubud. Close to the traffic lights at the end of Jalan Raya near the huge statue. The Tourist Office is open from 8am-8pm daily and located on the crossing of Jalan Monkey Forest and Jalan Raya, just across the Ubud Palace. Here they can offer you some maps, brochures and the monthly issue of Ubud Community with useful articles and a calendar of events. Australia, Jl. Prof. Moh. Yamin Kav. 51, P.O. Box 243, Renon, Denpasar (tel. 0361-235092 or 235093, fax 231990). In Ubud and its surrounding hamlets cultural influences and artifacts are still found. Besides absorbing the cultural beauty of Ubud there are many other things to do which always seem to be intertwined with the daily village life. For instance the nearby temples show you the historical and religious influences that are still present today while the many museums offer you the opportunity to learn about their Bali paintings, drawings, carvings and statues. Besides this you can also actively learn about the village's culture by participating in dance, paint, mask-making and cooking classes, for which you will need to do some shopping at the local market. Ubud is full of all types of restaurants and cafes. After just a couple of meters you will bump into one again. So no chance of getting hungry here. There is a mixed choice of restaurants such as the classy modern looking restaurants, restaurants that only serve organic food and drinks or restaurants that have a gorgeous gardens where you can sit on a big pillow on the floor. But there are also the basic ones (but always with some nice decoration) that just offer you what you're looking for good food. Below is a list of recommended Restaurants & cafes; it gives you at taste of what you can find in Ubud. The Bintang Supermarket in Sanggingan, the products are good as are the prices. It's in the same main street as the markets and the Palace but uphill and east from these. Tino's is a mini mart near Casa Luna on the main through road past the markets and the Palace intersection. Andong and Tegallalang Village north of Ubud boasts fabulous wholesale shopping and is aptly named "The Wholesale Rd". There are kilometres of shops selling woodcarvings, furniture, Xmas decorations, lighting, decorated pots, mirrors, jewellery, flowers and much more. Only 15 minutes from Monkey Forest road and great fun, though you can get a severe case of whiplash as you go along...looking from one side to the other, so much to see. Purpa Silver shop. Monkey Forest Road, on the right just south of the soccer pitch. Greatest range of chains. Dads can change money and get a Bintang at the same time. Seraphim for sterling silver. On Monkey Forest road towards the sanctuary end. Not cheap but excellent quality, even by European standards. Contemporary designs. Fixed prices are reasonable – from US$30. Re-sizing no cost. Putra Silver is at Batubulan on the way to Ubud. Two level building painted white with a big sign at the front. On the right as you go to Ubud. Excellent prices. There are many silversmiths in and near Ubud. Many will work to your design as a matter of course, but the cost will be higher if a one-off mould is needed for the piece. See Bandem Community of Silversmiths in Singapadu near Ubud, great prices and selection...plus made to order. Ebony Gallery in Mas, Master Carver. Seniwati Gallery exhibits only female artists. Some striking exhibitions. Ph 975 485. Sukawati Markets near Ubud. The markets 'wholesale’ that the southern sellers use to source their wares. Get Umble-umbles or Penjor, (amongst many other things) - the tall slim flags flown on bamboo poles throughout Bali, and temple umbrellas of various sizes. Don’t go if you suffer from claustrophobia, or if you must then stick to the street stalls. Try also the more local markets at Guwang about 3 Km before Sukawati which are good for paintings. Ubud markets. Different goods to Kuta, particularly watches if you search. Casa Lina Homewares. On Jl Raya Lungsiakan near the bridge. Tremendous range of goods. Kuluk Gallery also for homewares. In Kedewatan north of the Neka Museum, before Amandari Hotel. Babylon near Kukuk Gallery ‘is a treat for the senses’ – up-market homewares. Wardani’s on Monkey Forest Road, about across from football pitch, for fabrics. Will custom make for you. Delta Dewata Supermarket, Andong Rd. If you're looking for nice prints of the 'old masters of Bali art' go to the Neka Gallery. It's worth a visit even if you're not after prints. Here you will find the original of the most (poorly) copied painting in all of Bali; 'Mutual Attraction' by Abdul Aziz, and the story of how these two got together. Books - Periplus books in Tino's Supermarket on Jalan Raya down from Casa Luna, knowledgeable staff. Ubud music in the main street between the markets/palace corner and the supermarket – books and music and Ganesha Book shop. Bali Becak for beads. In monkey Forest Rd near the soccer pitch. Ubud Beads has wonderful gemstone beads. Two shops in Monkey Forest Road and one also in Celuk. Bali Arts Festival runs approximately mid-June to mid-July with performances, exhibits, crafts such as jewelry, paintings and fabrics on display and for sale. At the Art Centre in Denpasar and elsewhere around the island. Banyu Pinaruh, the day after Saraswati Day, is when Balinese go, at dawn, to beaches, rivers or other water sources, to pray for wisdom and to purify themselves. Ciwaratri or Shivaratri is the night of the god Shiva. A time for holy contemplation and purification, the Balinese do not sleep for one night. 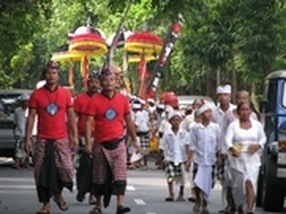 Galungan is the most important holiday in Bali. It represents the victory of Dharma (virtue) over Adharma (evil). A symbol of the holiday is a "penjor," which is a long bamboo pole elaborately decorated with woven coconut leaves, fruit, flowers and cakes. The penjor is placed on the right side of every house entrance, making for a very festive, colorful scene in all the villages. The Balinese dress in their very best clothes and jewels on Galungan. Imlek is the Chinese New Year. Kuningan is the second most important day of the Balinese Hindu calendar. The Balinese attend religious services and make offerings to the gods. At the holy spring temple Tirta Empul, at Tampaksiring, people partake in a ritual purification, bathing in the spring. This holiday usually takes place a week or so after Galungan but note they both often spread over several days. Ngarebong will take place at a temple in Kesiman village. While in trance, some worshippers stab themselves with a kris (dagger). Nyepi Day is the Balinese New Year in the Caka calendar. Held at the spring equinox, it is observed as a day of complete silence. On this day there is no transportation, no fires may be lit, no work is done and no one should be seen on the roads. Silence is important so that the spirits, which were aroused the night before, will think that Bali is empty and will, therefore, leave the island. This is the time to stay at your place of abode with a supply of drinks, food and something to read because even the TV does not operate. Ogga Ogga is a parade held on Pengerupukan, the night prior to the Balinese New Year. It is highlighted by a representation of the evil spirit. On this same day, purification sacrifices and offerings are made in village centers and at crossroads, throughout the island. Priests chant mantras to exorcise the demons (kala and buta) of the old year. In the evening people bang gongs and cymbals in the corners of houses, and parade through the streets with flaming torches, in order to arouse evil spirits. The parade follows Ngerupuk, an early evening ritual ceremony and is a must to view. The villagers in Ubud all compete to create the most bizarre and detailed statues made out of paper mache (some enormous and needing many people to support them) and carried around the village ending up in the main sports ground, complete with flashing lights, glowing eyes and some even have flames coming from their mouths. Saraswati Day is in honor of Batari Dewi Saraswati, the goddess of knowledge. Though no reading or writing is allowed on this day, books are taken to the goddess to be blessed. Sugihan is a holy day for purification. Tumpek Krulut celebrates the arts. Tumpek Landep is in celebration of all tools and appliances made of iron (knives, cars, televisions, etc.). There are various temple festivals on this day. Tumpek Uye is the day dedicated to the god in manifestation of Rare Angon, through a ceremony for animals. Tumpek Wariga is a ceremony for plantations. Tumpek Wayang is a ceremony for the leather puppets used in Shadow Puppet performances. Waisak (a Buddhist holiday) celebrates the birth, enlightenment and death of Buddha. The most important festivities take place at Borobudur near Yogyakarta in central Indonesia. PLEASE NOTE: When visiting temples be aware that you should wear long pants or a sarong with a selendang (long scarf) tied around the waist (men and women). Whilst you can take your own, most major temples have selendangs to borrow for a small donation. Women should also cover their upper arms in some way and usually many temples will have a dress display sign out front, so please honour their customs. It is also extremely bad form (in fact it’s taboo) for women who are menstruating to enter a temple.